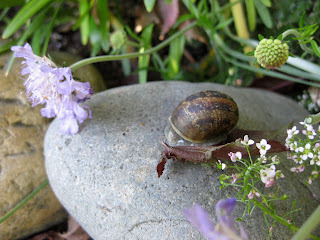 Growing A Garden In Davis: Happy Snails to You.. The snails are the happy ones this spring. And the earwigs and the armadillidiidae...more commonly known around here as roly polies. We've had cool, rainy weather off and on for far longer than normal. So much so that I have yet to plant cucumbers, zucchini or bush beans. The tomatoes just went in last week. I do have three varieties that went into wall-o-waters a while ago although two of those look less than promising. The Pantano Romanesco grown from seeds given to me by my friend Patsy does look like it will make it, though, and I took the wall-o-water off of it last weekend...just before the most recent cold rain came through. I put some of my basil starts out last weekend too and the roly polies are grateful. When I went out late one night to check for snails on them all I found was a gang of those little crustaceans that the kids like to collect. Apparently they need to collect more and I need to rethink the catch and release system we have in place. I have rings of copper scrub pad surrounding them which does help keep the snails at bay and I dust with diatomaceous earth (DT) but the rain negates the effectiveness of that. The leaves have gotten quite nibbled..I can only hope it heats up and the basil takes off in a big growth spurt outpacing the insect attack. Roly polies seem to cause more plant damage on young, tender growth. I have a few strawberry plants in a small wooden half barrel pot which I decided to move last weekend in preparation for planting the tomatoes. When I picked it up I disturbed a happy family of earwigs. I'm guessing it was an extended family gathering because there were upwards of two hundred earwigs running for cover as I lifted the barrel, which was a little too gross in my opinion. I ran and got my DT shaker (a re-purposed parmesan cheese shaker) and got some on most of them but I'm not counting on that decreasing their numbers significantly. They do, at least, become less of a pest when summer really heats up. 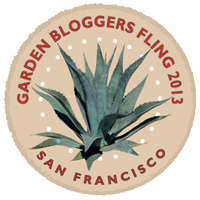 I am hoping to get some seeds into the ground this weekend...we are being told things are going to warm up soon. 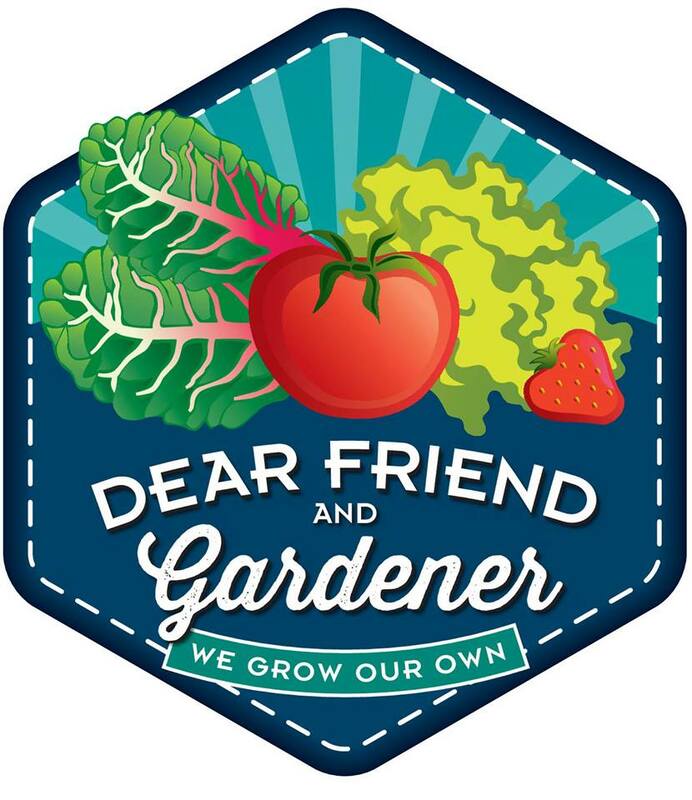 I would really rather think about fun things like seeds sprouting and tomatoes flowering than creepy crawlies in the garden. I hate those rolly-pollies! They've killed tiny young plants in my garden. I hope your weather gets back to normal soon. It sounds like you are on my planting schedule this year. I hate finding those big swarms of insects in the spring. For me, it was ants, millions of them by my garage door. I can't stand the creepy crawlies either- eeek! I know that is ridiculous for a gardener to say, but I always feel like they're creeping up the back of my neck. Sluggo is 'organic' -not toxic to pets or kids and works. I wish that I had gotten sluggo plus to take care of the earwigs, too. I also tend to keep my plants in pots untill they ar pretty big. I don't think I've ever seen an earwig in my garden. Snails and slugs, and rolie-polies/doodlebugs/pillbugs are another matter! I agree with Dave, Sluggo is great for getting rid of snails. It's pelletized iron, so when it breaks down, it enriches the soil. Yes...Sluggo is great! But it mostly cuts the numbers, never eliminates them. I still do my snail hunts each spring to aid in that cause. And I use Sluggo Plus because it's supposed to work on earwigs too...I find it hard to believe right now. I have a hobby gardening site and have nine natural ways to get rid of snails which may interest you. There are photos and simple instructions for each solution. There are many different ideas around and some work better than others depending on your climate and the design of your garden to name just a couple. At this time of year you will need to have some clever ways to stop them. I really don't like commercial baits as they can cause death and / or illness in other innocent pets, birds and animals. Please have a look and choose from the nine options and try to eliminate them sustainably.